The Allan Dixon family farmed lot 10, concession 1, NDS Trafalgar Township. This is on the north-east corner of Britannia Road, at Walker's Line. This location is on the north edge of dramatic Mount Nemo, part of the Niagara Escarpment and the Natural Heritage Network. The barn and the farmhouse were built by the Dixons. The lumber was drawn from Redhead Mill. The bricks came from Milton. This family picture was taken in 1943 on the farm. 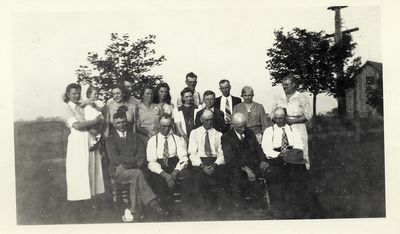 Back row, l – r: Margaret Dixon, holding her cousin Ruth Dixon, Irene (McLean) Dixon, Fred Dixon, Olive (Featherstone) Dixon, Priscilla Dixon, Eva and John Dixon, A. Hines (raised by Coulsons), Lorne Dixon, Mae (Dixon) Coulson, Jean (Alderson) Dixon. Front row; (seated) Arthur Coulson, Allan Dixon, Guy Dixon, William McLean, George Dixon. William McLean was an uncle by marriage, as he was married to Margaret Hume, sister of Priscilla Hume Dixon, mother of Allan, Guy, Mae, George, and Lorne Dixon. The farm was first surveyed as being located in Trafalgar Township, Halton County. In 1962, Trafalgar Township was amalgamated into the Town of Oakville. In the present day, the land is north of the City of Burlington in the Regional Municipality of Halton. People in Halton who live north of Dundas Street have always looked to the town of Milton as their regional centre.